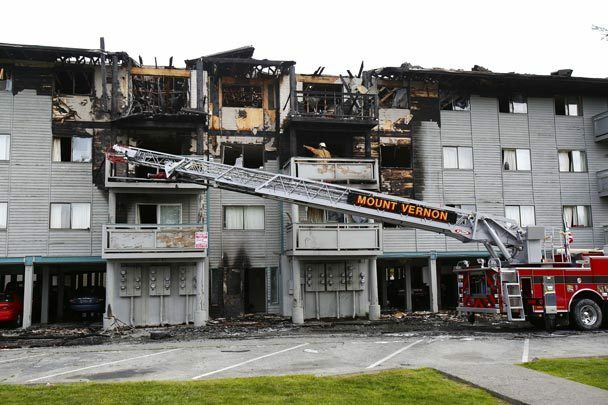 MOUNT VERNON (AP) — A police officer is one of five people injured and some 200 people displaced when fire erupted in an apartment in Mount Vernon. City public information officer Shannon Haigh says the officer was arriving at the fire before midnight Tuesday when something exploded and he suffered a minor hand cut. Three people from the Cascade West apartments were treated for smoke inhalation at Skagit Valley Hospital. Haigh says a man was found about two hours later and was flown to Harborview Medical Center in Seattle with burns to his airway and other parts of the body. The three-alarm fire caused heavy damage to the top two floors of the three-story building. About 200 residents have been displaced, and about 75 of them are being sheltered at nearby Skagit Valley College with help from the Red Cross.